Rosadigitale week is an international event for gender equal opportunities in technology, which will take place approximately from the 4th to 17th, March 2019. In the events map it will be possible to include also any events that will take place throughout the month of March. The moment is fast approaching and you do not have the faintest idea of what event to organize? Here are 16 tips of simple petals that can do for you! Have you ever heard of Canva? It is a software that allows you to create graphics in a simple way. You can register for free online! But what can you do with the program on the occasion of International Women’s Day? Realize with your students images that depict: gender equality, the great pioneering women of past or contemporary technology, or even create simple rules to raise awareness of gender equality. Another free software is Codecademy… does it tell you something? Have you ever tried Gifhy? A search engine that lets you create animated gifs! Being familiar with this tool is important … the fundamental part of the web is animation! 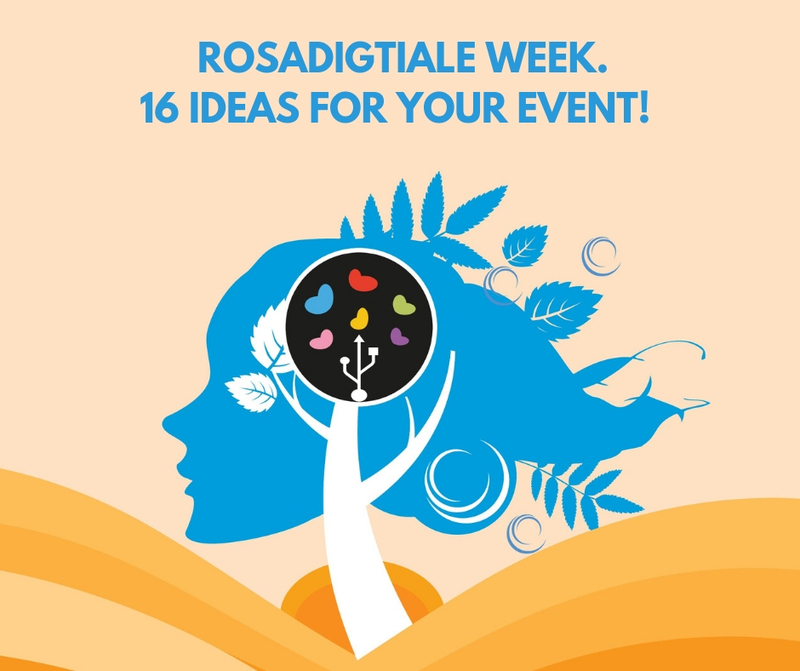 What gif can be created for Rosadigitale week? A small story composed of a series of images and elements in movement that tells of the different gender discrimination that are present in the STEM fields, or even of a small animated guide that shows how to prevent cyber bullying or that explains the concepts of gender equality. Why not a direct on Facebook, video on YouTube or on your website? If you own a company, we suggest making a video or live show in which you show the different characteristics that a candidate should have to join your team and make suggestions so that they can face the interview as best possible. Do you spend a lot of time on Wikipedia and would like to write or complete biographies? DokuWiki is a very simple system for creating collaborative encyclopaedias. It is and open and free software. You can download it and upload bios, guides, projects realized by a class and much more. One cannot fail to mention the famous “Scratch“. For those who do not know of it, it is a simple and intuitive graphic programming software. Have you ever tried MinecraftEdu? It is a fun game for everyone! Through the Java programming language it is possible to create modifications. Do you know the Telegram Bot? You can create them directly in the instant messaging service through The Bot Father. Here are some useful guides: PHP, Python, NodeJS. It is possible to realize them even without programming, by creating an RSS channel. What do you think of a nice article in your blog? You can indulge in writing the biography of an influential person in the field of technology or telling your professional story with the addition of advice for beginners in the field in which you specialize. You can explain some tricks that you use to work better, or make an interview with a person you value, a story or more. Have you ever heard of GitHub? It is a hosting program! Do you know of a programming language that often uses free software? During your event form a group, check if the projects of the programs that you like have the free source and collaborate with the official project team! Have you ever attended the Installfest? It is an event where experts help people to install Linux distributions also explaining their main features. Don’t be scared … Gnu Linux is free and easy! Ubuntu Studio exists for creators and So.Di.Linux for schools or teachers. Do you need to give free rein to creativity by creating an app for Android? App Inventor exists: simple development environment that allows you to create Android Apps in a simple way through a drag-and-drop system very similar to that of Scratch. With Open Data you have the possibility to create and use data! To realize a new service you could design a map starting from the opened data (an option can be the use of MapBox). There is also the possibility to create a chat bot that provides answers based on what you type and much more. Every municipality, province, region and country should have a page dedicated to European datasets. Knowing how to use LibreOffice today is important for the education of your students! Organize groups to build project prototype presentations with LibreOffice Writer to help break down the gender gap. Arduino and Raspberry the best electronic boards ever! … Reunite with those passionate and curious and experiment lots following the guides that you find in the official sites. The little ones can try S4A Scratch for Arduino or discover the electronics with the Great Limor Fried Circuit Playground!